Home / bakery / christmas / cupcakes / dessert / featured / food / mad butter / online sellers / The Foodie / thedessertjunkie / The Dessert Junkie: Cupcakes from The Mad Butter! In a previous post, I wrote about my struggles when picking out “generic-but-not-generic” Christmas presents, and the solution I found for a portion of my corporate friends are personalized notepads—thanks to PoshThemes Design and Print Solutions. 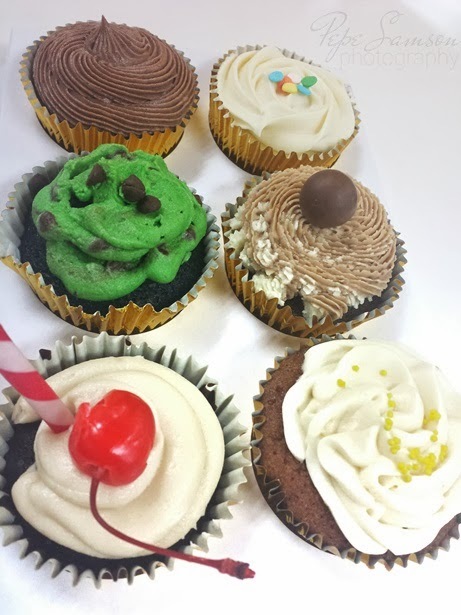 While scanning my Facebook news feed earlier, I stumbled upon the posts of another online seller: The Mad Butter, a home-based bakeshop that specializes in cupcakes! Instantly, a light bulb snapped on. 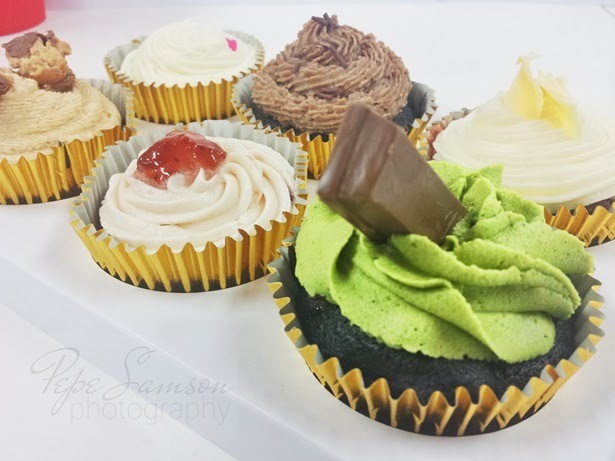 Cupcakes, like ramen and milk tea, quickly became a fad in Manila—one whose popularity, like the other two, grew rapidly and one which isn’t likely to go kaput anytime soon. With full-on bakeshops and stalls that churn out cupcakes popping out around the metro like bisexuals in Greenbelt (hahaha), what extra can The Mad Butter bring to the table? The answer? Personalized, made-to-order cupcakes! Tell them what you want, they can bake and design it. 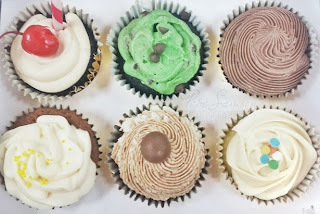 Cupcakes for all occasions? 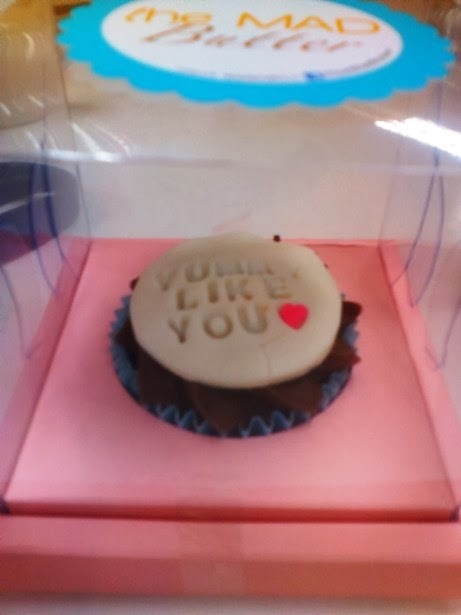 Check out these Mothers’ Day cupcakes I ordered from The Mad Butter months ago! 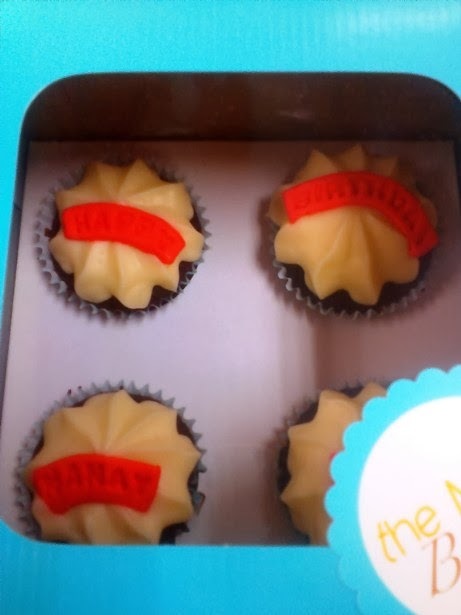 I had a hard time choosing a gift for my mom that time—especially with all the accessories and stuff she already has—so I took a risk and decided to surprise her with some cheesy, personalized mini cakes. She totally loved them! 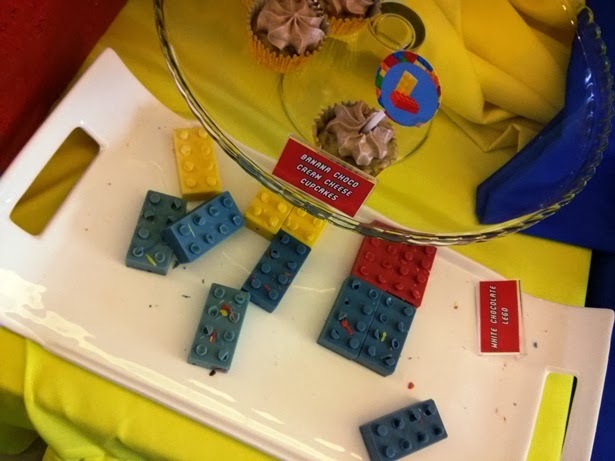 Several months back, I attended a Lego-themed kiddie party and it was The Mad Butter that supplied the desserts! Check out the cupcakes with Lego designs on them. Aren’t they cool? 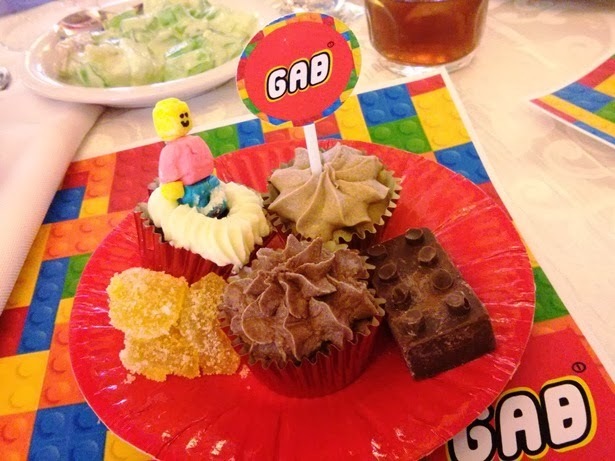 Customized desserts were not only limited to cupcakes—even the chocolate bars and candies adhered to the Lego theme! Birthdays, anniversaries, Valentines’ Day—give away something with a touch of your own thoughts instead of something store-bought! In case you’re not following The Mad Butter on Facebook, now is the perfect time to do so as they have launched new flavors especially for the Christmas season! Check out some of my favorite flavors below! 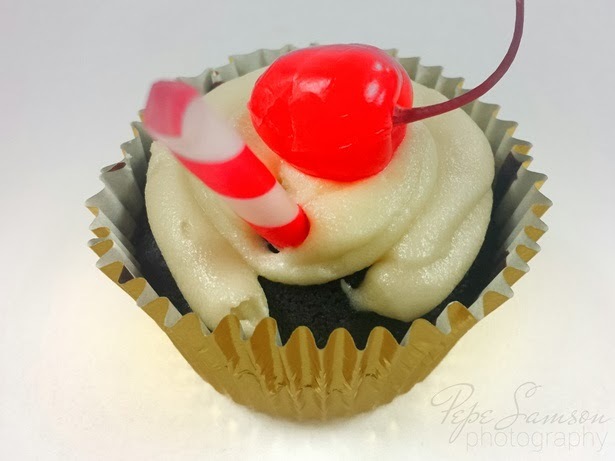 Chocolate base with a cream frosting that has a subtle hint of Cola flavor and aroma. Pretty ingenious, if you ask me. Kids and adults alike would love it! 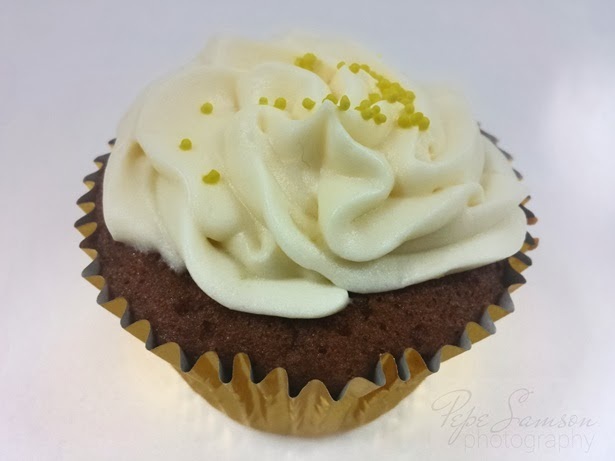 Banana-flavored base with a chocolate and cream cheese frosting. I totally liked the combination because the end product wasn’t too saccharine. 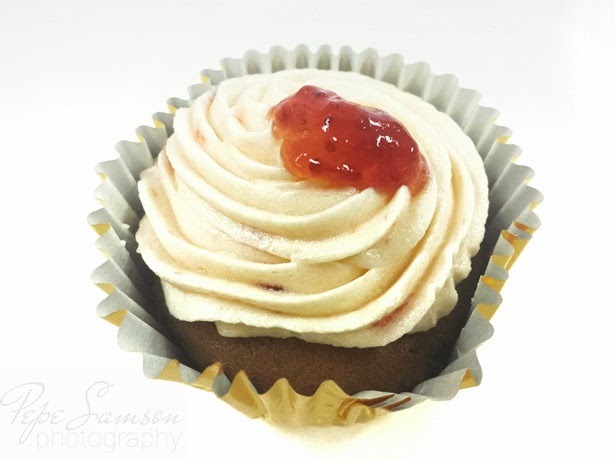 A reinvention of the plain peanut butter cupcake, with the addition of strawberry jelly on top! 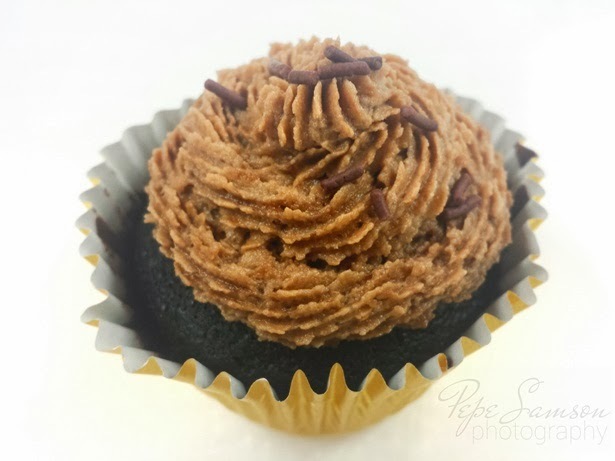 This cupcake brings back memories of PBJ mornings. It’s not too sweet either, so expect to be able to eat more than a whole piece. First-time ever to eat a honey-lemon-flavored cupcake! You’d think it would taste weird because “honey lemon” calls Nestea and Halls to mind, but this concoction was just too awesome for words! My favorite among all of The Mad Butter’s creations. Could you get any weirder? 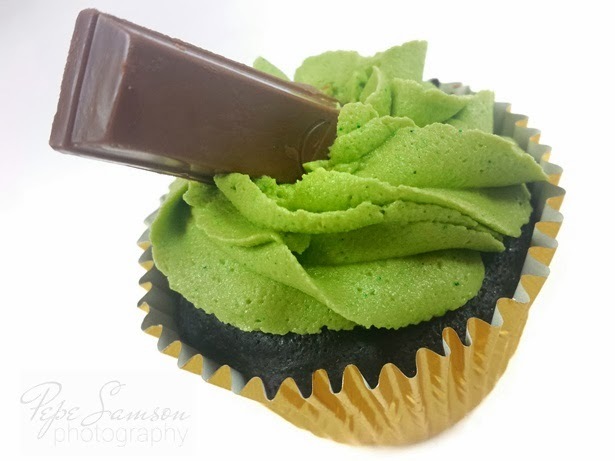 Kitkat bars on top of matcha frosting AND EMBEDDED inside a chocolate cupcake base. 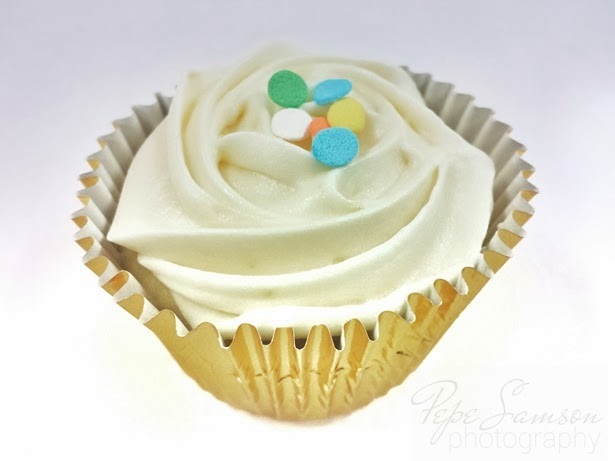 Have you ever tried Slice’s Sir Francis M. Bacon cupcake? The first time my friends and I tried it, I was the only one who liked it. Same thing when I made my officemates taste the KitKat Matcha. I’m a fan of weird combinations (Chips Ahoy on beer, Cracklings on catsup, etc.) and trust me, the Kitkat Matcha is worth a try! Besides, I could understand if you would refuse to dip your Chips Ahoy in beer, but to eat Kitkat with green tea? Hello?! Green tea always gets the attention: in cakes, donuts, macarons, etc. So why not look the other way for a potential equal? 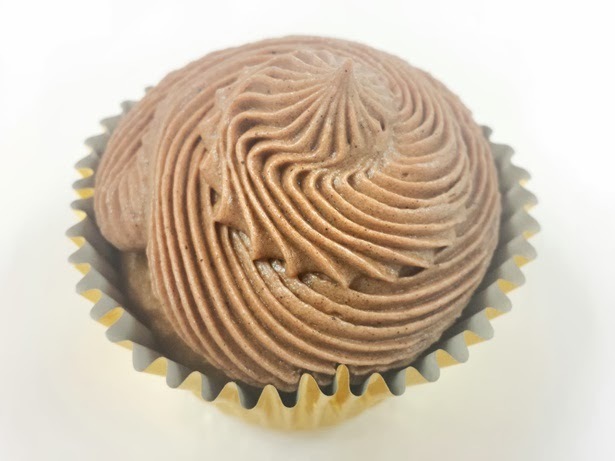 Earl is a cupcake with the hints of Earl Grey tea—refreshingly light and not too sickly! 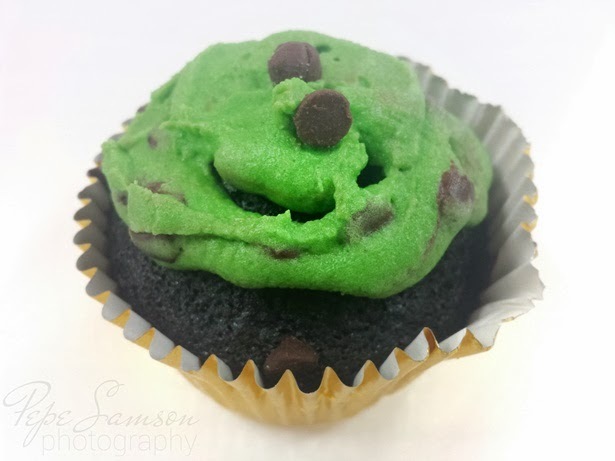 Your regular chocolate cupcake spiced with peppermint and topped with chocolate chips. 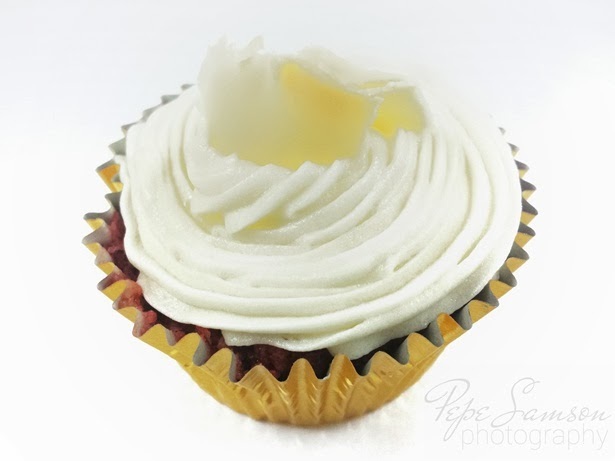 Red velvet cupcake with cream cheese frosting! 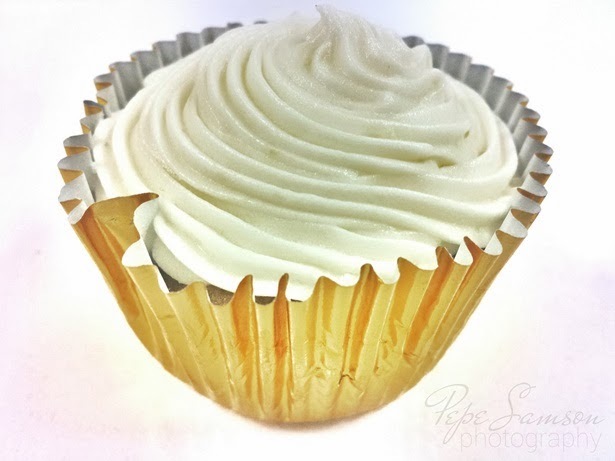 Every cupcake The Mad Butter makes is very soft and moist—the base doesn’t fall apart but doesn’t stick to the wrapper either! The below 7 flavors are also available, all equally delicious if a bit too sweet for my taste (I have the taste buds of a forty year-old). 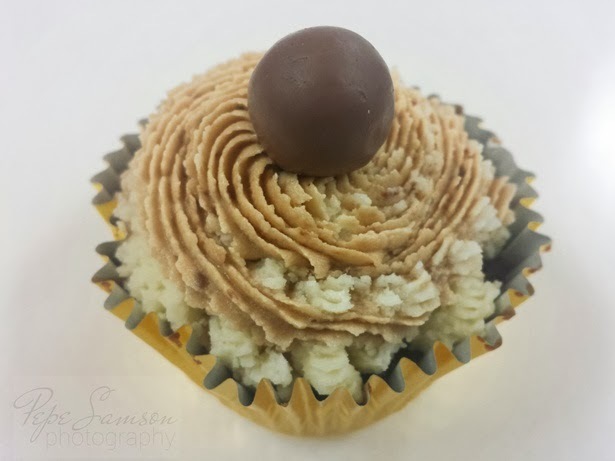 But since most of them have chocolate toppings, for the kids they will surely be a huge hit! 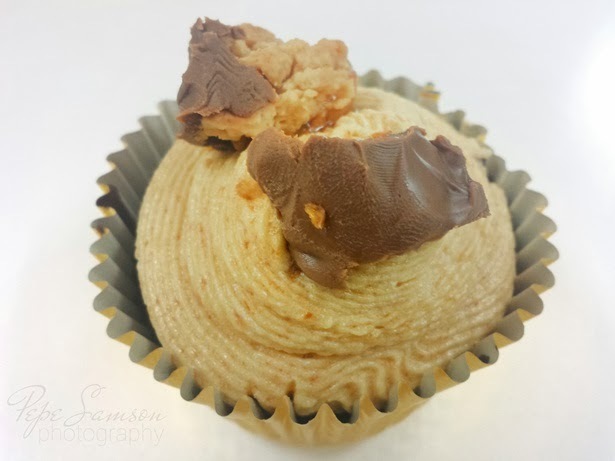 Whether it’s for an ordinary day of pigging out on delicious desserts or for a special occasion to celebrate with family and friends, The Mad Butter can provide precisely what you’re looking for. Get your cakes personalized, put your own message, and instruct them how it should look—you can even pick which flavor you want. Or just order some of the available designs and flavors to share with the people closest to your heart. Perfect giveaways especially if you have a lot of female friends—girls just can’t say no to sweets! Above: some packages I recommend. 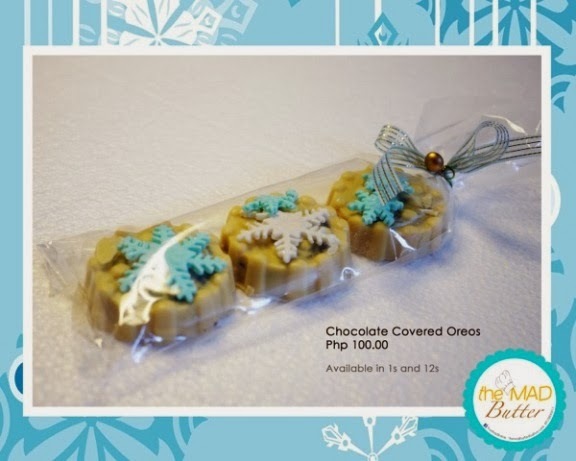 The CHOCO COVERED OREOS ARE AWESOME!!! 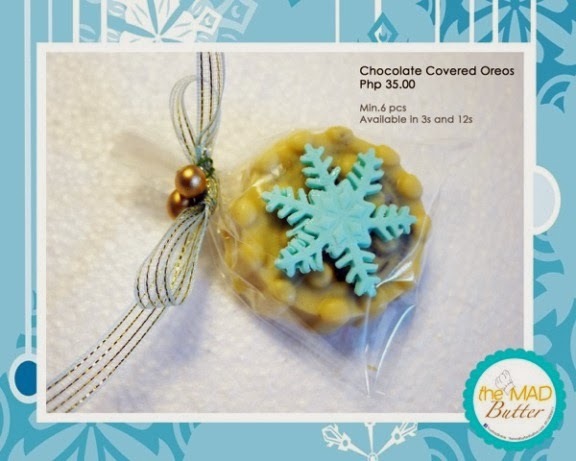 More gift sets on The Mad Butter's Facebook page! Pickup points and reminders. All 14 flavors I mentioned are actually available. 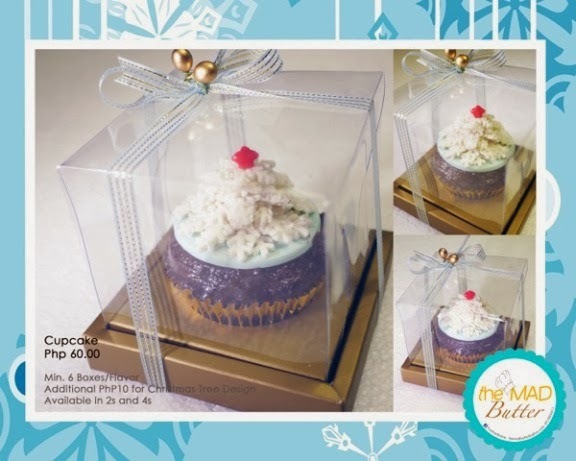 Check out The Mad Butter’s Facebook page for more information on how to place your order as well as the Christmas packages prices. 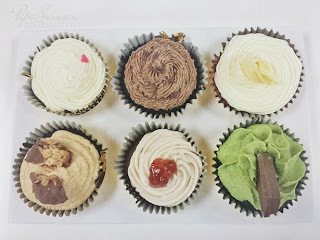 In my experience, they needed at most a week’s lead time to make your cupcakes, so the best time to order is now! 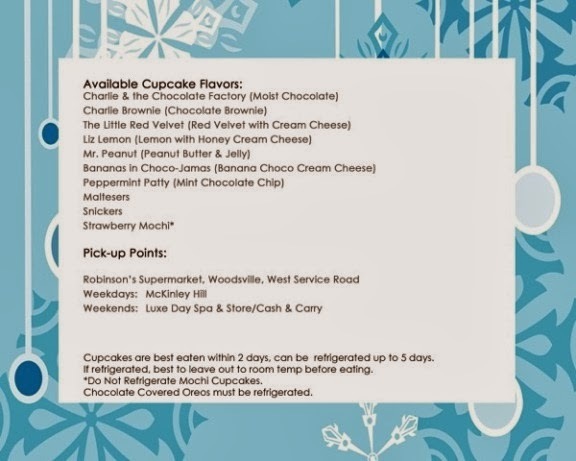 For details on how to pick-up your cakes, you can reach The Mad Butter through the contact info I provided at the bottom of this post. 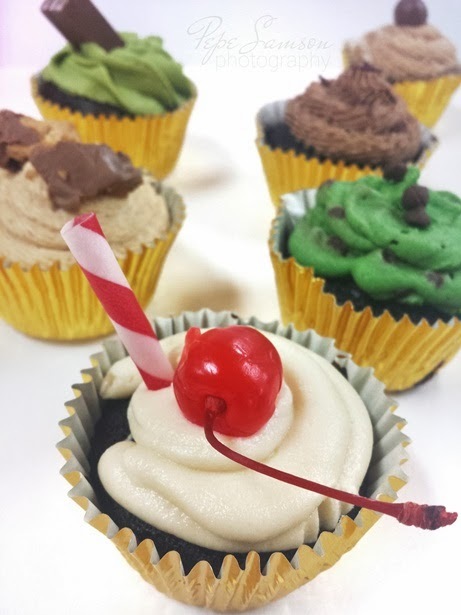 Enjoy your cupcakes, and happy holidays! waaaahhhh nakakabaliw lahat ng flavors. I hope ma-try ko to lahat when I visit there...punta ako Taguig this Sunday, I hope may branch sila dun. Thanks for posting this. Haha! Mahilig ka nga pala sa cupcake! Hmmm. Advise mo agad sila kasi wala silang shop mismo, homebased seller sya and by order. :) Thanks for reading!